The German Enigma device has always been a fascinating gadget for hackers. We’ve seen various replicas and emulators created over the years, and it was recently even the subject of our weekly Hack Chat. But if you think about it it’s not really a surprise; the Enigma has the perfect blend of historical significance and engineering wizardry, with a healthy dash of mystery thrown in. Why do the bad guys always have the coolest toys? If you’ve ever wanted your own little Enigma replica to explore, [Mark Culross] has put together a project which makes it easier than ever. In fact, it’s so straightforward that some of you reading this post will probably be able to put one together as soon as you’ve read this post from stuff you already have lying around in the parts bin. All you need is an Arduino Uno, an Adafruit 2.8″ TFT Touch Shield, and a penchant for World War II technology. 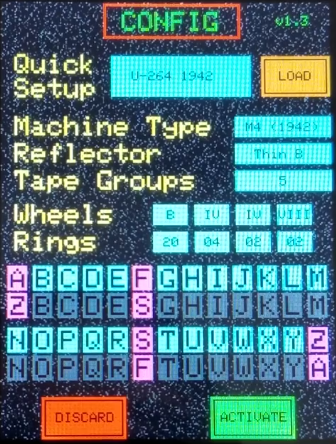 Thanks to the relatively high-resolution touch screen, [Mark] was able to develop a user interface for his Enigma that really gives you a feel for how the original machine worked. Obviously it’s considerably simplified from the real-world version, but using a stylus to tap the rotors you want to spin or the wires you want plugged in makes for a more immersive experience than many of the previous attempts we’ve seen. With a tap you’re even able to load historical machine configurations, such as how the Enigma aboard the submarine U-262 was configured when the Allies intercepted its encoded messages in 1942. [Mark] says this project was always about developing the software, and he leaves the actual hardware implementation as an exercise for the user. Just to play around with the software it’s enough to hook up an Arduino and the touch screen, but we’d love to see somebody really take the idea and run with it. Add some batteries, a charging circuit, and put it all in a little wooden box for that authentic Enigma look. Can’t forget that iconic wrinkle finish paint, either. Over the years, we’ve seen replica Enigma machines in all shapes and sizes. From ones you could mount on your wrist, to full size replicas using modern components. We’ve even seen one variation that you can print out on a couple of sheets of paper. The parade of recreations shows no sign of stopping, and we wouldn’t have it any other way. MIT is well known for rigorous courses, but they also have a special four-week term at the start of each year called the IAP — Independent Activities Period. This year, the MIT Radio Society had several interesting presentations on both the history and application of radio. You weren’t there? No problem, as the nine lecture were all recorded for you to watch at your leisure. You can see one of the nine, below. These aren’t some five minute quicky videos, either. They are basically live captures that run anywhere from an hour to almost two hours in length. The topics are a great mix including radio history, software-defined radio, propagation, radio astronomy, RADAR, and even 5G. You might have to pick and choose. Some of the lectures are suitable for just about anyone. Some assume a bit more radio expertise in electronics or math. Still, they are all worth at least a cursory skim to see if you want to really sit and watch in detail. The only nitpick is that some presenters used a laser pointer that doesn’t show up on the inset slide graphics in the video. That makes sense because the inset slides are not really in the room, but it can make it a little difficult to understand what the speaker is pointing to on a crowded slide. Of course, if you want to dive deep and you need more background, MIT — along with many other institutions — will let you use their learning material for free. We were especially fans of the circuits class but there are many others including just raw materials from OCW. If you’re like me, chances are pretty good that you’ve been taught that all the elements of the modern computer user interface — programs running in windows, menus, icons, WYSIWYG editing of text documents, and of course, the venerable computer mouse — descended from the hallowed halls of the Xerox Corporation’s Palo Alto Research Center in the early 1970s. And it’s certainly true that PARC developed these technologies and more, including the laser printer and object-oriented programming, all of which would grace first the workplaces of the world and later the homes of everyday people. The story goes that Atari was developing a premium model of their popular home video game console, the Atari 2600, for the 1981 fiscal year. Internally known as the Stella RC, this model revision promised touch sensitive game selection toggles, LED indicators, and onboard storage for the controllers. The focus of the project, however, was the “RC” in Stella RC which stood for remote control. Atari engineers wanted to free players from the constraints of the wires that fettered them to their televisions. Problem with the prototypes was that the RF transmitters in the controllers were powerful enough to send a signal over a 1000 ft. radius, and they interfered with a number of the remote garage door openers on the market. Not to mention that if there were another Stella RC console on the same channel in an apartment building, or simply across the street, you could be playing somebody else’s Pitfall run. The mounting tower of challenges to making a product that the FCC would stamp their approval on were too great. So Atari decided to abandon the pioneering Stella RC project. Physical proof of the first wireless game controllers would have been eliminated at that point if it were created by any other company… but prototypes mysteriously left the office in some peculiar ways. Atari did eventually get around to releasing some wireless RF 2600 joysticks that the FCC would approve. A couple years after abandoning the Stella RC project they released the Atari 2600 Remote Control Joysticks at a $69.95 MSRP (roughly $180 adjusted for inflation). The gigantic price tag mixed with the video game market “dropping off the cliff” in 1983 saw few ever getting to know the bliss of wire-free video game action. It was obvious that RF game controllers were simply ahead of their time, but there had to be cheaper alternatives on the horizon. Nintendo AVS console deck and IR controller on display. Video games were a dirty word in America in 1985. While games themselves were still happening on the microcomputer platforms, the home console business was virtually non-existent. Over in Japan, Nintendo was raking in money hand over fist selling video games on their Famicom console. They sought to replicate that success in North America by introducing a revised model of the Famicom, but it had to impress the tech journos that would be attending its reveal at the Consumer Electronics Show (CES). The prototype system was called the Nintendo Advanced Video System (AVS). It would feature a keyboard, a cassette tape drive, and most importantly two wireless controllers. The controllers used infrared (IR) communication and the receiver was built-into the console deck itself. Each controller featured a square metallic directional pad and four action buttons that gave the impression of brushed aluminum. The advancement in video game controller technology was too good to be true though, because the entire system received a makeover before releasing as the Nintendo Entertainment System (NES) that Christmas. The NES lacked the keyboard, the tape drive, and the IR controllers and its change in materials hardly captured the high-end flash of the AVS. The removal of IR meant the device was cheaper to manufacture. A decision that ultimately helped the NES to become a breakout success that in turn brought back dedicated video game consoles single-handedly. The millennium: a term that few had any use for before 1999, yet seemingly overnight it was everywhere. The turning of the millenium permeated every facet of pop culture. Unconventional popstars like Moby supplied electronica to the mainstream airwaves while audiences contemplated whether computers were the true enemy after seeing The Matrix. We were torn between anxiety — the impending Y2K bug bringing the end of civilization that Prince prophesied — and anticipation: the forthcoming release of the PlayStation 2. Sony was poised to take control of the videogame console market once again. They had already sold more units of the original PlayStation than all of their competition combined. Their heavy cloud of influence over gamers meant that the next generation of games wasn’t going to start in until the PS2 was on store shelves. On the tail of Sony announcing the technical specs on their machine, rumors of a new competitor entering the “console wars” began to spread. That new competitor was Microsoft, an American company playing in a Japanese company’s game. Compared to incandescent lightbulbs, LEDs produce a lot more lumens per watt of input power — they’re more efficient at producing light. Of course, that means that incandescent light bulbs are more efficient at producing heat, and as the days get shorter, and the nights get colder, somewhere, someone who took the leap to LED lighting has a furnace that’s working overtime. And that someone might also wonder how we got here: a world lit by esoteric inorganic semiconductors illuminating phosphors. The fact that diodes emit light under certain conditions has been known for over 100 years; the first light-emitting diode was discovered at Marconi Labs in 1907 in a cat’s whisker detector, the first kind of diode. This discovery was simply a scientific curiosity until another discovery at Texas Instruments revealed infrared light emissions from a tunnel diode constructed from a gallium arsenide substrate. This infrared LED was then patented by TI, and a project began to manufacture these infrared light emitting diodes. It was darkest hour for the video game industry following the holiday shopping season of 1982. The torrent of third party developed titles had flooded the home video game console market to the point of saturation. It incited a price war amongst retailers where new releases were dropped to 85% off MSRP after less than a month on the shelves. Mountains of warehouse inventory went unsold leaving a company like Atari choosing to dump the merchandise into the Chihuahuan desert rather than face the looming tax bill. As a result, the whole home video game industry receded seemingly overnight. One company single-handedly revived video games to mainstream prominence. That company was Nintendo. They’re ostensibly seen as the “savior” of the video games industry, despite the fact that microcomputer games were still thriving (history tends to be written by the victors). Nevertheless their Nintendo Entertainment System (NES) was an innovative console featuring games with scrolling screens, arcade-like sprites. But the tactic they used to avoid repeating the 1983 collapse was to tightly control their market using the Nintendo Seal of Quality. From the third party developer perspective, Nintendo’s Seal of Quality represented more than just another logo to throw on the box art. It represented what you could and couldn’t do with your business. Those third party licensing agreements dictated the types of games that could be made, the way the games were manufactured, the schedule on which the games shipped to retail, and even the number of games your company could make. From the customer side of things that seal stood for confidence in the product, and Nintendo would go to great lengths to ensure it did just that. This is the story of how an Atari subsidiary company cracked the hardware security of the original Nintendo and started putting it into their unofficial cartridges.